How do you get your real estate listing on TV? Ultimately, it all comes down to these six words: who, what, where, when, why and how. Macias PR recently held a webinar that explained to realtors how they could leverage the media to sell their properties. Here’s an excerpt from that webinar. It explains why those questions are crucial for publicity. PR vs advertising. It’s a question I hear a lot from companies trying to reach consumers. When you take a deeper look at the ROI and benefits of PR and advertising, you will see that a story on the news is much more affordable than ads – and it remains on the web long after your campaign ends. – PR Continually Works for You long after your campaign is over. Macias PR held a webinar on this topic. Here’s an except from that webinar that explains the benefits of PR. When it comes to publicity, a solid narrative trumps connections in the media and everything else. You don’t have a media campaign unless you have a narrative. So how do you identify a narrative? Every campaign is different because every story is personal, however, there are guidelines you can use to understanding or identifying your personal narrative. Macias PR recently held a webinar on how to identify that narrative. This video outlines those first steps and explains what exactly a narrative is. I posted that impromptu quote on Facebook several years ago during a vacation in a foreign country at an underground club. I just realized that quote is not a shallow status update inspired by spirits. It’s actually a principal that applies to public relations – or for that matter with business. But let’s focus on why that quote applies to PR and how it can help your tech startup or business build a brand on the web. Public relations and journalism are similar in that creative ideas drive the coverage. In the morning news meetings, the person with the best story idea is always driving the conversation. I became an Executive Producer with NBC in New York at a young age – not because of my experience, but because of my creative ideas. And when I hired freelance producers at NBC in New York, I chose creativity over experience when everything else was equal. That’s because creativity drives all news story ideas. Experience or great sources don’t really inspire great ideas. I could argue they actually inspire complacency since a person is rarely pushed outside of his comfort zone. Earlier this week, a person told me he only wanted to work with a PR firm that has experience in the pharmaceutical industry. It didn’t matter that my PR firm has delivered prominent news stories for major health care clients. I respect that decision because he knows his business better than I do. But I do know the business of PR and if I were looking to hire the best PR firm in NYC, I wouldn’t hire a PR firm based on experience or their contacts. I would hire the most creative PR firm in NYC. I frequently meet with tech startups who ask me, “why can’t I do PR on my own?” Many of these smart entrepreneurs tell me they already have great contacts in the media, so why should they hire a PR firm? Many people wrongly believe securing a story in the news or on TV has everything to do with who you know. Yes – a contact will help but it’s more like an assist. It’s not a slam dunk. I’ve written about that misconception extensively in the past, so I won’t go in-depth here, but there is another PR lesson that the picture (above) better explains. During my time as an Executive Producer with NBC, many publicists tried to woo me with drinks or dinner, thinking it would lead to a story on TV. You can be married to the Executive Producer, but if you don’t have a strong narrative or interesting story to tell, your startup or business won’t get publicity. I’m not a gemologist, but I know a rock doesn’t transform on its own into a beautiful diamond. It takes time, precision, perfect cuts and polishing to present the diamond in a way that we expect. It’s no different with a story idea – or for that matter – contacts. It doesn’t turn on its own into publicity. It takes the refining of an idea that develops it into a news story. It also takes a craft to develop the pitch in a way that gets reporters’ attention. That requires proper execution. You can write the best media pitch, but if you send it to the wrong reporter, you will fail. It gets even more complicated when you are actually designing and executing a full-scale media campaign. So if you’re considering doing PR on your own, I will tell you, of course you can do it. The better question to ask is how long will it take to succeed and how many hours will it require? This story is a continuation of my political and media analysis for CNBC on the presidential campaigns. This week, we took a closer look at the official launch of Jeb Bush presidential campaign. What are his challenges and what can he do to improve his standing among voters who are losing interest? 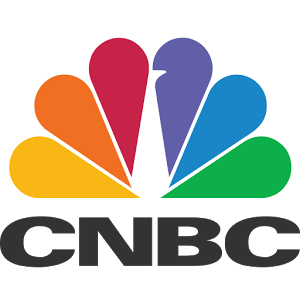 Click here to read my analysis on CNBC. CNBC has asked me to give weekly political and media analysis on the presidential candidates. What are the candidates doing wrong and right with the media? How can they better position themselves with voters? What are their communications teams doing right and wrong? Marco Rubio has recently been criticized for his spending habits, but this negative story actually presents an opportunity to position in him a way that better relates to voters. Click here to read how his political campaign can change the narrative into a message that resonates with the 99 percent. It’s never good to mix politics and business, but CNBC recently asked me what kind of advice I would give Hillary Clinton now that her trust numbers are plummeting in the polls. This is a situation that could apply to any business – not just in politics. Once the public starts to distrust a product or service, it gets much harder to influence consumers via the media. So what should you do if your business starts to receive more negative complaints from clients? Get in front of the negative news and focus on improving that situation before it gets worse. Here’s some advice I gave CNBC involving Hillary Clinton and her dropping poll numbers. Every great athlete has a DNA that gives him an edge regardless of sport. Basketball needs a tall genetic code, football prefers weight and bulk, etc. It’s no different with publicity. During my time with NBC and CBS, I saw a certain kind of DNA excel in journalism. He was driven, adaptable, curious, secular and even gregarious. While public relations is a different industry, the genetic code is similar. 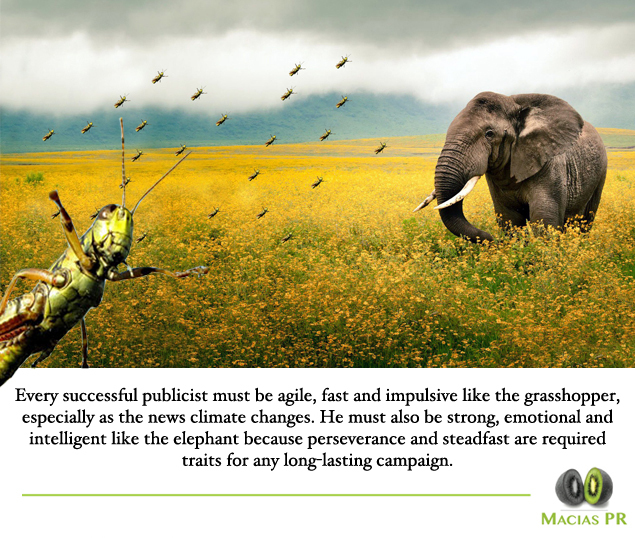 Just like the above Facebook post demonstrates, if you’re looking for the best publicist, you want to find a person who is agile, fast and impulsive like the grasshopper. 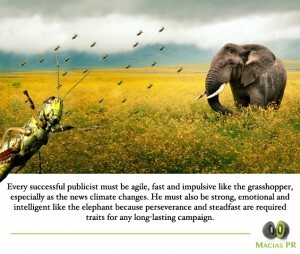 News moves quickly and a great publicist understands how to adapt to that changing environment. But at the same time, a great PR firm also must show perseverance and strength because great media placements don’t happen overnight. A successful media campaign takes time and a lot of lobbying. It also takes a specific kind of creative intelligence to frame a story in a way that the media will find intriguing. Keep those traits in mind as you look for the “Best PR Firm”. Bigger is not always better. The elephant alone is weak if he relies solely on his powerful weight. The grasshopper is an easy kill unless he keeps moving. But when combined, the two make for a powerful force especially in the world of public relations. And that’s advice that applies to publicity for every industry – tech, financial, service sector – you name it. It’s great to get a major story placed with the New York Times or Good Morning America regardless of industry, but sometimes smaller is better, especially in the world of B2B PR. I meet with a lot of potential hedge fund PR clients who ask me how PR can help their funds reach potential institutional investors. They tell me they don’t see the value in PR when it comes to reaching their targeted audience. I usually ask them if they read the Wall Street Journal in the morning or watch Squawk Box while they’re getting ready for work. It’s no different for the money managers running the major institutional funds. They read the Wall Street Journal while Bloomberg or CNBC air in their office because they know the smallest of news can impact their portfolios. 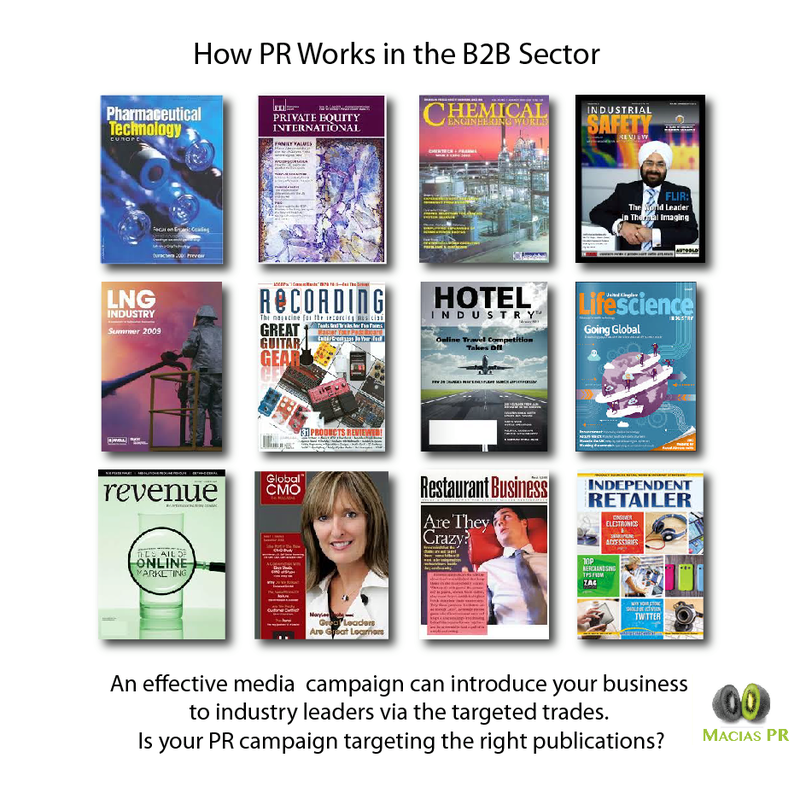 But PR in the B2B space can be even more effective than those targeted placements. Every industry has a trade publication that keeps the industry players on top of the major trends. When I was an Executive Producer with NBC in New York and Senior Producer with CBS in New York, the executives who ran our TV programming read Broadcasting & Cable Magazine to hear about the latest syndication deals or profiles on the latest leaders. If your business was trying to sell newsroom software, that is the place to reach those decision makers. It’s no different from other industries – tech, private equity, cyber security, accounting, engineering or even just a retailer selling to other retailers. The trades can be a more efficient, targeted and faster way to reach the decision makers. 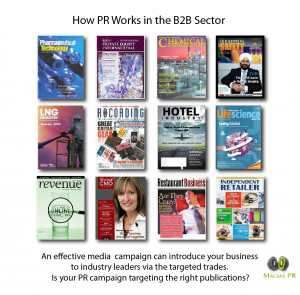 And if you still aren’t sure how a B2B PR campaign could work in your industry, ask yourself what you read every day. The photo above this story gives you a better idea how broad a B2B campaign can be in the world of just one industry.